Concussion has been a relevant news topic lately, especially with the new Will Smith movie, Concussion, just hitting the big screen. Concussion can be described as any trauma; external or internal, direct or indirect, to the face, neck, or head. It may or may not be accompanied by symptoms such as loss of consciousness, amnesia, headache, dizziness, nausea, etc. For some time, we believed that we could grade concussion determined by loss of consciousness, amnesia, headache, or altered orientation at the time of injury. New research suggests concussion severity can only be determined after the individual is free of all concussive symptoms. Also, these clinical symptoms are not very reliable predictors in outcome, prognosis, or return to play. So, how are we to know when a high school athlete’s symptoms are fully resolved? Especially when according to McCrea M and colleagues, only 47% of high school athletes report their concussion. 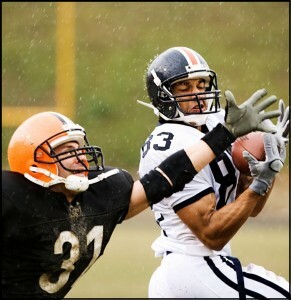 A relatively new term Chronic Traumatic Encephalopathy, or CTE, also known as “punch drunk syndrome” was determined around 2002, when an autopsy was performed on a lifelong football player who was demonstrating Alzheimer’s type behaviors. The pathology uncovered in the autopsy was found to be different than a brain with Alzheimer’s, however. In an effort to prevent this phenomenon from affecting our younger athletes, in August 2015 Illinois Governor Rauner signed a Return to Play/Return to Learn bill (SB 07 (Public Act 99-245)) that states school boards from middle school up to high school should abide by IHSA protocols for concussion management. This includes a 2 hour concussion training session for coaches, school nurses, trainers, and game officials and encourages concussion education for players, parents, and students. Because of this bill, a player should not be allowed back in play or school until evaluated by a physician. Also, it implements preseason neuro-cognitive testing for a baseline score to compare post concussion testing to. This test is infinitely randomized for more reliable scores and prevents return to play/school too soon for the healing brain, even if reported to be “symptom free”. This is especially important as an NFL athlete in 2010 was quoted saying “When it comes to concussion, don’t believe me when I tell you that I’m okay.” There is a stigma that comes with being injured, as if the player in question is not tough enough to endure returning to play. This “shake it off” mentality needs to fade away when it comes to one’s brain, and hopefully it will as concussion is more understood. Concussion management is becoming more stringent, and for good reason. Whether it is in the news, the field, or the movie theatre, the severity of concussion is part of the conversation right now. Healthcare providers, teachers, parents, coaches, referees, and athletes need to become comfortable with reporting signs and symptoms of concussion. When we understand what to look for, we can all play a role in protecting our young athletes. Concussion Management. Retrieved March 16, 2016, from http://www.ihsa.org/resources/sportsmedicine/concussionmanagement.aspx. McCrea M, et al (2003). Clinical Journal of Sports Medicine. Sharma, Rishi (2016). Concussion Update [PowerPoint Slides]. ApexNetwork Now Open in Maryland Heights, MO! Ribbon Cutting Ceremony at ApexNetwork in Lake St. Louis/Dardenne Prairie, MO!